Join us in Celebrating Community Health Worker Week! This week we are celebrating Community Health Worker Week! This is a great opportunity to celebrate community health workers in Minnesota and raise awareness about the importance of their work. Community health workers (CHWs) serve as a bridge between the health care, government, social service systems and the communities to which they belong. CHWs provide their communities with information about health issues and link individuals with the health and social services needed to achieve wellness. CHWs may be known by many names including health coach, community health advisor, health promoter, village health worker, community health aide or a variety of other names. In Spanish-speaking communities, community health workers are often referred to as health promoters or promotores(as) de salud. Whichever term is used, the work has a common goal: to advocate for and assist their clients in achieving an optimal level of health and wellness. 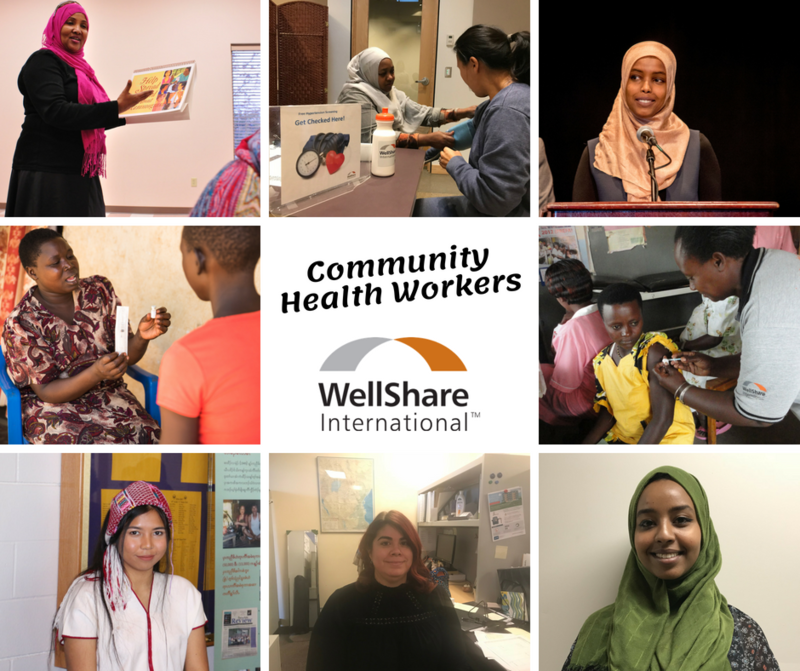 Here in Minnesota, WellShare’s CHWs work primarily with immigrant and refugee populations. They work with and within their communities to connect individuals to the U.S. health care system and support them in maintaining or improving their health. Our community health workers are bilingual and trained to provide a range of health services, such as home visits, promotion of a tobacco-free lifestyle, nutrition education, prevention and management of chronic diseases, and family planning and reproductive health education. Where does a community health worker work? According to the Bureau of Labor Statistics, community health workers may spend much of their time making home visits, communicating with community members, holding events, and collecting data. They may be employed by healthcare facilities such as hospitals and clinics, colleges, public health departments, faith-based groups, nonprofits, and private businesses. How do you become a community health worker? Most community health workers need at least a high school diploma. Many places of employment require a certificate or an associate’s degree that cover topics such as advocacy, wellness, health promotion, ethics, and cultural awareness. Minnesota Community & Technical College and St. Catherine University offer a 17 credit certificate that can be completed in one or two semesters. Overall, community health workers are on the frontline of community health and are important members of the healthcare system. WellShare is recognized as an expert in the recruitment and training of community health workers. Since 1979, we have trained over 6,000 community health workers – an evidence-based approach for reducing health disparities – and our health education materials are used by health providers around the world. Join our CHW Peer Network, which offers quarterly trainings for members and manages a listserv to quickly get information out to members. To learn more about Community Health Workers read the Community Health Worker (CHW) Toolkit- A Guide for Employers, created by the Minnesota Department of Health in collaboration with WellShare International and Minnesota Community Health Worker Alliance.